THIS THURSDAY FEB 26 AT THE OWL AND THISTLE!!! Mike has performed with jazz greats such as Herbie Hancock, Chet Baker, Tony Bennett, Wayne Shorter, Joe Henderson, Bobby Hutcherson, Woody Shaw, Larry Coryell, Jack Wilkins, Wallace Roney, Geri Allen, Billy Childs, James Genus, Bob Hurst, Chris Potter, Onaje Allan Gumbs, Bobby McFerrin, Al Jarreau, Dave Liebman, Nat Adderly, Oscar Brown Jr., Bill Doggett, Mose Allison, Maxine Brown, Gil Evans and his orchestra…. The New York Times recently proclaimed: “It’s hard to find a more fruitful mediation on American music than in the compositions of guitarist Bill Frisell.” For this concert, the Seattle treasure pairs with up-and-coming guitarist Russell Malone, who is making his mark in the jazz world by blazing his own, decidedly unique trail into “The Great American Songbook.” Not to be missed. The Pacific Jazz Institute at Dimitriou’s Jazz Alley presents vocalist Karen Shivers and her band for one night only. Band members include Bill Anschell (piano), Doug Miller (bass), and Greg Williamson (drums). Doors open at 6:00pm and show starts at 7:30pm. Seattle based jazz vocalist Karen Shivers, is considered a ‘natural’; she has a wide-vocal range that is powerful, warm and rich. She is a singer steeped in the ‘classic’ vocal style of Sarah Vaughn and Carmen McRae. In 2008, Karen won the Seattle/Kobe Japan Sister City Female Jazz Vocalist Competition. Karen’s sophisticated approach to songs includes a mixture of attitude, verve and soul. The ever-increasing recognition of Karen’s talent has created opportunities for her to open for such world renowned jazz vocalists as: Ms Dianne Reeves and Ms Ernestine Anderson. Born in St. Louis, MO., Karen is the daughter of a Tuskegee Airman and an elementary school teacher. Karen was the first African American woman elected to office in Kitsap County, WA, and served as a Central Kitsap School Board member in Silverdale, WA. She attended UPS Law School, but left it to be a Caregiver when her mother became terminally ill. After her mother’s death, she decided to pursue what she had always loved to do, singing jazz. Karen developed her singing style while working along side jazz pianist Bob Nixon, former pianist for Pulitzer-winner Charles Mingus and Ernestine Anderson. Karen’s sophomore CD, “Precious Love” (12/05, Pony Boy Records), was listed as one of the best new Jazz CD releases for 2005, by KPLU 88.5, Jazz NW host Jim Wilke. Karen will be joined in concert by her CD Band mates: Bill Anschell (piano), Doug Miller (bass), and Greg Williamson (drums). Drop us a line and let us know what else is happening tonight! Tickets for the up-coming Frank DeMiero Jazz Festival are now being offered to the public at not just a reduced price, but at “name your own price” prices. Emails have been sent out offering tickets to all three headlining concerts, which are currently priced between $35 – 40 each, for whatever the ticket buyer would like to pay. We understand that the state of the economy is unsettling. And yet, your support of this cause is important. That’s why we invite you to NAME YOUR PRICE for tickets. For more information about Name Your Own Price tickets to the Frank DeMiero Jazz Festival, click here. Despite difficult economic times, Royston said, overall attendance at the two-week festival so far has been down only twelve percent compared with the 2008 festival. Tickets for the Wilson-Moran concert lagged despite Ms. Wilson having won a Grammy award last week. Royston said that other weekend concerts will go on. Among the headliners are Bobby Hutcherson, Lou Donaldson, Aaron Parks, Pat Martino, Jane Bunnett and Kurt Elling. Last weekend, it seemed that, except for a few empty rows in the backs of the halls, the concerts were well attended. Portland’s weather, which can be rainy at this time of year, was cold and dry, making for exhilarating trips through downtown between concert halls, clubs and restaurants. Since I last attended the Portland festival in 2007, it has made a significant improvement in the way it presents music. The prime-time evening concerts now take place not in hotel ballrooms with boomy acoustics and frustrating sight lines, but in performance halls designed for satisfying aural and visual experiences. Continue reading Doug Ramsey’s Rifftides blog. The band will be recording both nights for an up-coming CD on Origin Records. Be a part of history and reserve your table today by calling 206-443-4221. 7pm – MJ Bishop Tour Sendoff Show! We had a server problem Thursday night. We are back online now … thanks for your patience. 7pm – Chris Morton Trio featuring Siobhan Brugger, two-time soloist winner at the Lionel Hampton Jazz festival and the 2008 Seattle-Kobe Sister City Jazz Competition winner! Judy and I took the train on Friday and went to the Joe Lovano conversation with Doug Ramsey at the Art Bar, had dinner there and went to the main event of the opening night – the first public performance with full orchestra of Terence Blanchard’s “A Tale of God’s Will” (Requiem for Katrina). The CD won a Grammy last year. It is very moving music, a lament for New Orleans, and very stirring. Sound was a bit of a problem, the strings were miced, the second violins were louder than the firsts and the sound was grainy, to boot. Wish they had played it entirely acoustically – in Schnitzer Hall it would have sounded better, but we were glad to be able to hear it live. Terence’s introductions added a lot to the program. An opening set with Gonzalo Rubalcaba Quintet was not very satisfying for us, but after the concert, Devin Phillips (a New Orleans refugee now living in Portland) was leading his very swinging quintet at the Art Bar across the street…. a great nightcap. Sometimes the local cats outshine the visitors. 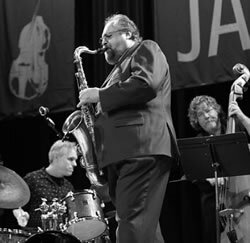 Joe Lovano’s Us5 is a new group I hadn’t heard and was curious about. They played Saturday afternoon at the Portland Art Museum Ballroom which seemed acoustically friendly to jazz. Walking in we immediately noticed two drumsets on stage and thought “Oh-oh…” but about half way through the first tune, we were looking at each other and saying “Wow!” Gerry Hemmingway and Francisco Mela were the drummers, both energetic and imaginative and very complimentary. They didn’t have a drum battle, they didn’t both play all the time, and when they switched from one to the other it was seamless. They traded back and forth with Joe, pianist James Weidman and bassist Michael Formanek. It was one of the highlights of the weekend. Jacky Terrasson Trio opened, with a lot of sizzle but seemingly lacking much substance. We passed on the Dianne Reeves concert, but look forward to seeing her at Bellevue with Russell Malone. We had a nice dinner at Jake’s Grill and went to the late set Saturday night with John Scofield Trio at the Art Museum Ballroom again. Sco’ played with Matt Penman on bass and Bill Stewart (another great drummer!). Joe Lovano introduced them, and Sco’ said he’d be back. After several trio tunes, Lovano joined them and they played like they were still a working group (Joe was in the band in the early 90s). The crowd included a lot of younger listeners and they were really into it. We sat next to a couple of kids, one a guitarist, the other a drummer and they were in heaven! Great concert! We wrapped up the night at the Art Bar again, with Dave Frishberg, John Gross and Charlie Doggett Trio doing some rare tunes (Dave doesn’t sing with this group, they have a different repertoire.) Nice hang with Lovano, Doug Ramsey, Michael Cuscuna, Ashley Kahn, et al. We closed the joint. Some of the audiences were disappointingly small – the Terence Blanchard concert especially, and nothing appeared close to selling out. Probably the biggest crowd we saw was at the Scofield concert. They have now cancelled next Friday night’s main event with Cassandra Wilson and Jason Moran due to poor advance sales, but all other concerts and events are going on. Although he was born and raised in the former Soviet Union, Igor Butman’s life was destined to have an American flavor to it. His father was, of all things, a drummer in a Dixieland jazz band, the best in all of Leningrad. The opportunities to listen to and play jazz were few, but the young Butman found them. He studied the clarinet, then the saxophone, growing up to become perhaps the most famous jazz musician in all of Russia. He is often called the Russian Wynton Marsalis and was a favorite of President Clinton. Butman, 47, is a true celebrity in Russia, a one-person entertainment enterprise. He is a cultural ambassador, bandleader, owner of a jazz club, television host and celebrity in his homeland. He is the face of jazz in Russia.